If you’ve been meaning to learn to crochet, here’s a pattern that not only teaches you to chain, make single crochet stitches, double crochet stitches, and increases--it also teaches you how to crochet in the round. 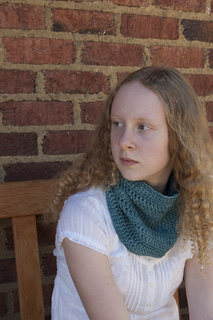 The result is a comfy cowl you’ll be happy to wear or make for someone special. All steps of the process are explained and accompanied by photographs showing you how to do the steps. Even if you already know how to crochet, you’ll want to make this cowl in several colors for a new wardrobe staple. Choose a soft, worsted weight yarn and get your hook ready!